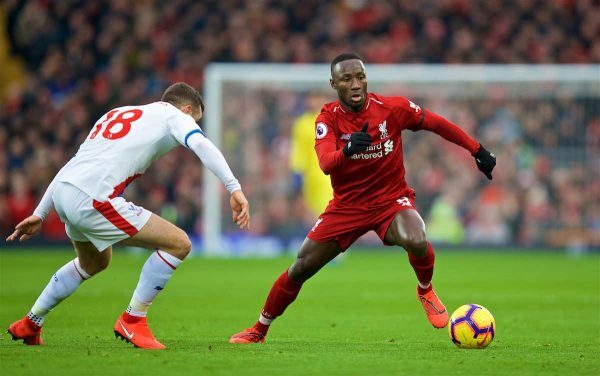 Liverpool edged a seven-goal thriller against Crystal Palace to cement their position atop of the Premier League table, which left plenty to discuss. Liverpool and Palace are no strangers to a dramatic occasion, and Saturday was no different. The Reds were twice tasked with finding the winning goal after Andros Townsend first put the visitors in front before James Tomkins levelled in the second half, after goals from Mohamed Salah and Roberto Firmino. 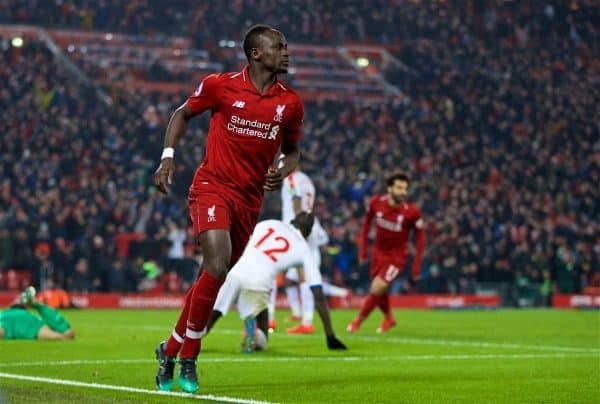 But a second from the Egyptian—his 50th in the Premier League—and a goal from Sadio Mane secured all three points, as Max Meyer’s goal proved only to be a late consolation. 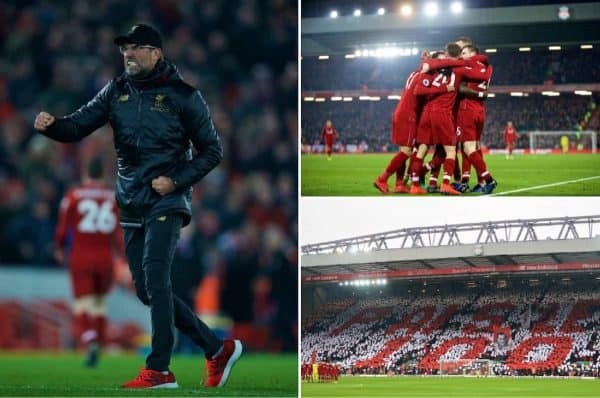 This Is Anfield trio Joanna Durkan (@JoannaDurkan_), James Nalton (@JDNalton) and Joel Rabinowitz (@joel_archie) were on hand to discuss the highs and lows of the win and Naby Keita‘s form. JAMES: The resilience and the stubbornness, not buckling under the pressure of being behind when sitting at the top of the Premier League. It’s good that things can change for the better mid-game too, as they came out for the second half looking a different, more expansive side. Few players would have scored the goal Salah did, which was a lot more difficult than it looked, and the speed at which he’s reached 50 goals shows how good he’s been for the club. When he comes out with things like “I’m looking forward more to getting to the 50 with Liverpool because I got two with Chelsea“—even better. It looks bad defensively to concede three goals, but none of the xG models have Palace on more than one, with the average around 2.8-0.8 in favour of the Reds. Hodgson’s side also had zero ‘big chances’. It would be more worrying defensively if the xG was higher. JOEL: Liverpool have needed to show their mental strength on numerous occasions this season in the face of adversity, but none more so than here. It was difficult not to fear the worst going into half-time at 1-0 down, but the way the players came out in the second half and responded with two goals in such quick succession was mightily impressive. Credit must also go to Klopp there (you can imagine what he might’ve said to them in the dressing room). 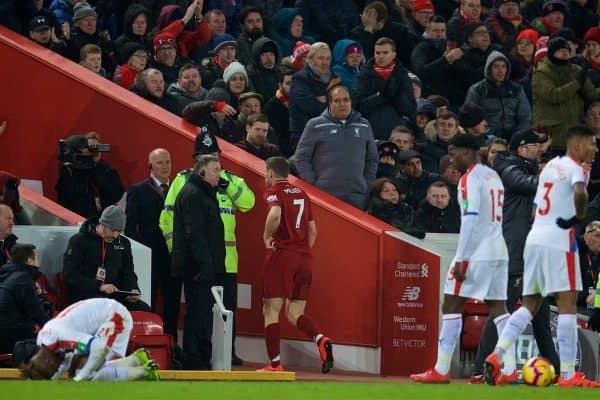 To then regain the lead after 2-2, and then score again in stoppage time even after Milner’s sending off again showed enormous character, albeit with more than a slice of fortune about the manner of some of the goals. 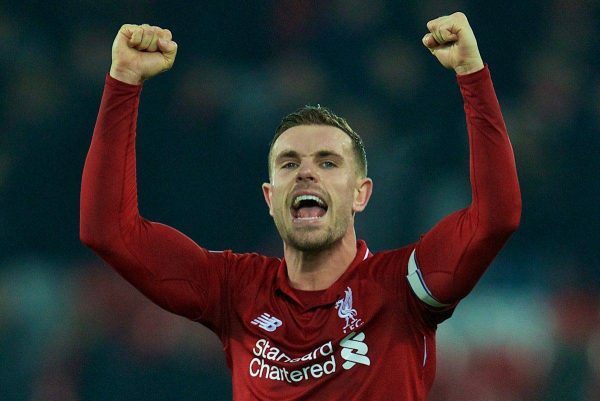 I think Henderson deserves credit on an individual level—he was outstanding throughout, and put in a tremendous shift both on and off the ball. Overall, it was vitally important to get over the line and secure the three points, and for the attackers to bail out the defence for a very rare off-day, when it has often been the other way round this season. Eleven days break between now and Leicester, including a trip to Dubai to take stock and hopefully reintegrate some players returning from injury—it keeps Liverpool in a really strong place with 15 games left to go. JOANNA: Liverpool have rarely had to face the prospect of recovering from a deficit in the Premier League this season, and after a first half which left a lot to be desired their patience and mental fortitude has to be commended. A win like that cannot be understated such is the rippling effect it has on confidence, morale and momentum—not to mention the league table! Like Joel, I thought Henderson played brilliantly and had a consistent level of output throughout, whereas others tended to waver. Perhaps too eager to press in the phase where Palace opened the scoring, but he was simply immense and his work off the ball from thereon out was imperative to the result—and Salah deserves a mention for his goalscoring feats. 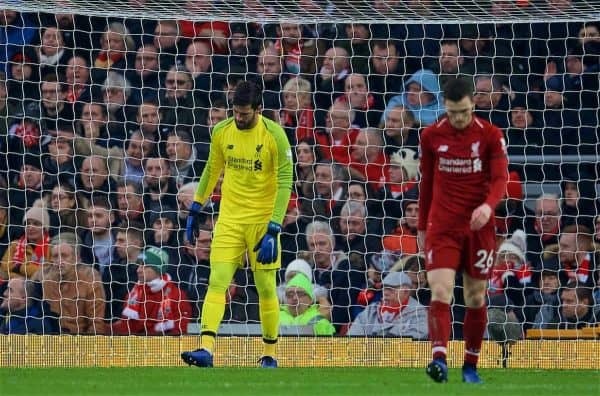 On the whole, while the game made me a nervous wreck, it was pleasing to see how the Reds didn’t fold under pressure of the match itself or in the position they find themselves in the league standings. That’s 23 games down with three more points in the bag, now on to Leicester. JAMES: What Liverpool do need to worry about is how Palace were still able to score three when they weren’t expected to by pre-match predictions or by the post-match data. Defensive problems can filter through a side, and the trouble with Wilfried Zaha down the right was having a knock-on effect on the rest of the side. There were some poor decisions in the buildup to the first goal conceded with six players pressing three opponents high up the pitch which left Milner isolated, and then left others desperately covering. JOEL: Conceding three goals is not something we’re remotely used to seeing anymore with this Liverpool side, and this was completely out of character given the phenomenal defensive record this season. Palace carry an enormous threat on the break with the pace and trickery of Zaha, Townsend and the marauding full-backs, and Liverpool were repeatedly open to the counter-attack throughout the game. The opening goal should’ve been a real wakeup call, but Palace continued to get a lot of joy when they did manage to bypass Liverpool’s press. We have controlled games superbly this season, but this was unusually chaotic and open. The second Palace goal from the corner was a really poor one to concede and made things much nervier than they should’ve been. Milner, I think, had a really tough game at right-back up against a brilliant player in Zaha, struggling to live with his pace and movement, and of course the red card was frustrating and could’ve easily proven costly had Mane not scored in stoppage time. 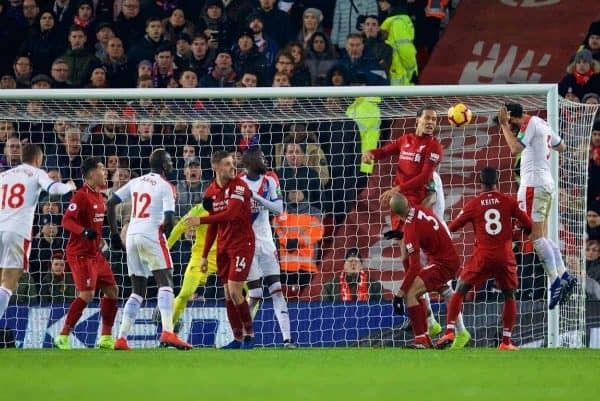 I think Liverpool also really missed Wijnaldum’s calming presence at times, and lacked a player who could just hold on to the ball under pressure and cool things down when Palace were throwing men forward towards the end. Regardless, a fantastic result, if a little too heart-in-mouth for my liking! JOANNA: In a way it was like turning back the clock to a time where Liverpool needn’t worry about the amount of goals the opposition scored because we would simply outscore them anyway. We were uncharacteristically unorganised for large parts and it came as surprise considering how defensively sound Liverpool have become. The obvious weakness in the side was at right-back as Zaha had Milner’s number and too often it handed Palace the attacking impetus, and his red card was frustrating to say the least. With injuries still plaguing the defence it throws up another conundrum for Klopp to solve should Gomez and Trent remain sidelined, although Camacho did has chances no harm. Here’s hoping that this type of result is now out of our system and we can enjoy a smooth run-in—one can dream, right? 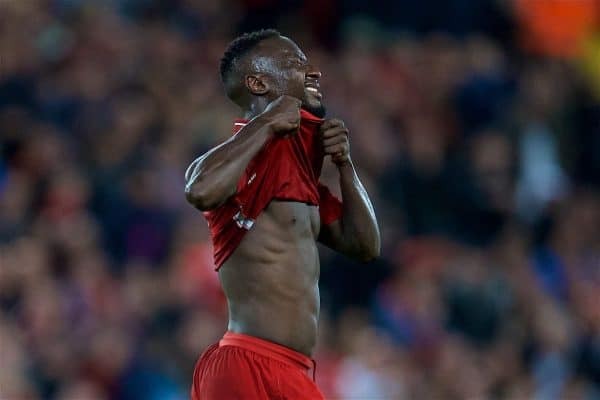 …and Keita’s form, is it a cause for concern or a case of playing out of position? JAMES: Keita is doing a job, but the problem is that the delay on the transfer and his performances in the Bundesliga meant he was built up to be the new Steven Gerrard, so is expected to more than just do a job. He will still be the new No. 8 the club need going forward but at the moment he’s struggling in attack, although he’s still very useful in defence in the way he bounces around the pitch closing down opponents. He was occasionally a left-sided central midfielder in Germany, but for Liverpool he’s been nudged perhaps too far to the left for his liking. That said, wherever he’s playing there is no reason he should be mis-controlling the ball or misplacing passes, but maybe moving back into the the middle would make him feel more at home and iron out these issues. He bagged an assist though, which is a positive. 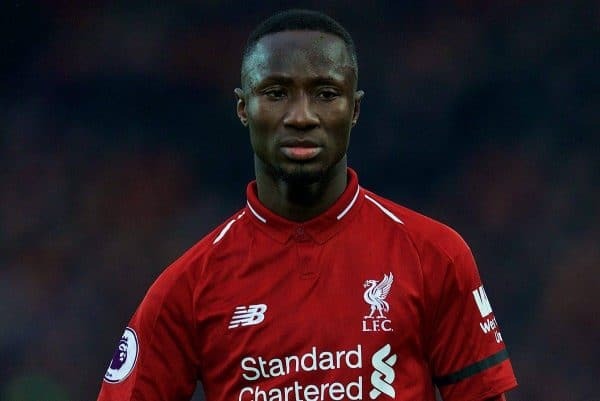 JOEL: I recently wrote a piece about Keita’s struggles this season and the factors behind his largely underwhelming displays. This was another frustrating performance for the most part, and I really don’t think that role cutting in from the left suits him at all well. Whenever he picks up the ball, his options are restricted and because he lacks the pace of a natural winger, he tends to make the easy pass inside and often gets crowded out. His success at Leipzig often came from picking the ball up in deeper, more central areas where he could get his head up and drive forward with lots of options to pass to in front of him. I don’t think Klopp yet trusts him with the defensive responsibilities of that role in this Liverpool side, hence why we’re seeing him operate further forward where his influence is severely blunted. He did, however, pick up his first assist with the pass to Firmino for his goal, which should hopefully give him some confidence going forward. We all expected more than what we’ve seen so far given his talent and what he produced in Germany, but he is still just 23 and Klopp will no doubt have loads of patience with him. Long term, I think he’ll become a really influential player for Liverpool but it’ll take a while longer than most of us anticipated. JOANNA: For me there’s no doubt over Keita’s ability and we shouldn’t look to worry too much, he’s shown glimpses of what he is capable of although it has yet to truly click for him. The Premier League does often require an adjusting period, but playing on the left has hindered the match-winning qualities he possesses, as like James and Joel mentioned, his chances to drive through the middle of the park are few and far between. 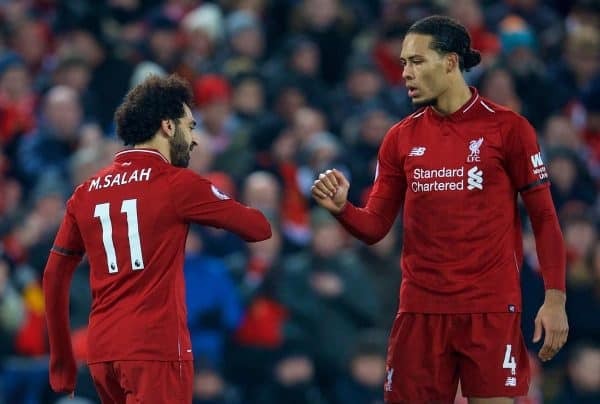 Liverpool often come up against opposition who look to frustrate, and the majority of his appearances to date have come at times where he has little space to exploit. In saying that, I would like to see an overall improvement in his ability to do the basics well as at the moment he is struggling to do that. Of course, we would have all loved for him to have made an immediate impact but there is still plenty of time to do so, and I firmly believe he will come good.